My FAVORITE retailer, TJX, parent company to TJMaxx, Marshalls, and Home Goods is selling out its American roots, and sending tech jobs offshore. Cognizant, the largest H1B visa procurement company in the U.S. in 2017, is replacing TJX tech staff as the vendor of choice to supplant the U.S. IT workforce. As local news reports, http://www.wcvb.com/article/framingham-based-tjx-lays-off-300-employees/20654258 the bulk of the IT jobs are leaving while a couple key positions will be rehired by the vendor to allow for “knowledge transfer”. In Billions Lost: The American Tech Crisis and the Road Map to Change, the practice of offshoring tech labor, where the H1B visa holder is the onshore manager, supported by foreign tech labor, is precisely the paradigm going into effect. The visa becomes a multiplier for many more jobs going overseas. If the executives at TJX were pressed into innovation rather than offshoring, TJX would be making more investments in technology and it’s American tech labor force. Tech investments would enable TJX to successfully compete against their more technologically savvy retail competitors. http://marketmadhouse.com/tjx-makes-more-money-lays-off-workers/ Instead, TJX has hired H1B visa holders in the U.S. into their management ranks, once foreign IT workers are in management they look for ways to outsource and offshore jobs rather than employ American workers. The “easy” excuse to send U.S. tech jobs offshore rather than innovate and improve within our own country, perpetuates the downward spiral of U.S. tech workers and the U.S. tech industry. When foreign workers are entrusted with the back office operations of American companies, not only do the IT jobs go offshore, but so does the data. Once credit card, personal or merchandising data leave our shores, the laws and regulations associated with data privacy no longer are valid. All data becomes more susceptible to cyber threats when it goes offshore. 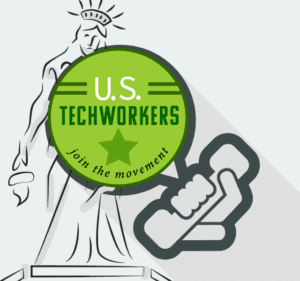 Every IT worker being laid-off from a steady tech job in the U.S. due to offshoring will suffer anxiety, stress, and potentially financial hardship. More importantly, their family will be strained as that IT worker looks for new employment, typically in an industry outside of the IT field, as the U.S. technology field for American tech labor is shrinking. With every IT job that is offshored, our country, our economy, and our children are put at risk. Our country loses a wage earner, loses the taxes that wage earner contributed, incurs additional debt to pay that laid-off worker unemployment benefits, loses the “multiplier” effect for every purchase that worker makes on a daily basis. The negative economic effect of sending IT jobs offshore is HUGE for the local economy and more importantly, for our national economy. Our country loses the knowledge that the IT worker has, the efficiency, and the quality. Most importantly, our country loses the opportunity to innovate, push forward, and reduce costs by any other measure related to this job loss. Our children are at risk every time an IT job is offshored. When children see their parents or grandparents laid-off, they typically do not follow in their career footsteps. Every time a U.S. tech worker is laid-off, the cause for our nation’s youth to shy away from STEM education and career aspirations is affirmed. American children will not pursue IT careers when layoffs are a guarantee. Women in tech have seen a steady decline since 2000 due to lack of opportunity. TO IMPROVE ALL THINGS AMERICAN, WE MUST STOP THE EXODUS OF TECHNOLOGY AND TECHNOLOGY WORKERS OUT OF THE U.S.